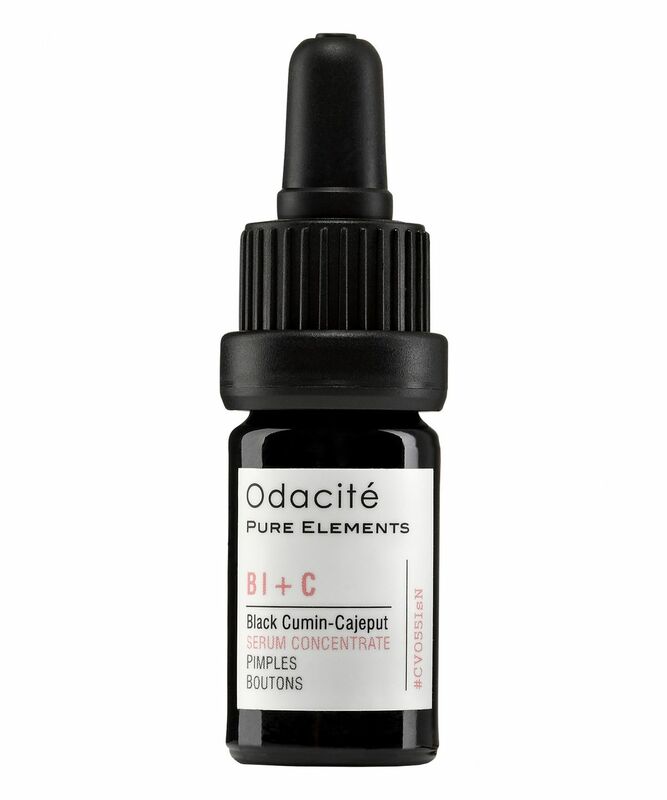 Developed to penetrate deep within pores, Odacité’s Pimple Serum Concentrate gets straight to the root of skin problems – smoothing, purifying and clarifying, so skin becomes beautifully uniform and luminous. With black cumin oil, to help draw out embedded impurities and counteract break-out causing bacteria, alongside therapeutic cajeput – which acts at the source of potential eruptions, to help prevent spots developing. A targeted addition to your morning skin care ritual – cajeput is renowned for its aromatherapuetic ability to promote clear thought and focus – this works wonderfully alone, or in collaboration with the other blemish-boosters in Odacité’s potent, rehabilitative range. Just apply a few drops (either alone, or mixed with Oily-Acne Prone, Combination or Clogged Pores Serum Concentrates) directly to slightly damp, just-cleansed skin; or add a drop or two to your preferred daily hydrator, to help re-establish a flawless and radiant visage. Does what it claims, will repurchase. Although rather pricey, this is my third bottle. Whenever I have a small hormonal acne, I reach out to this because it is really effective. The smell is quite herbal and therapeutic and with a small drop, the angry pimple calms down quickly and goes away. I highly recommend. I’ve tried so many products for breakouts over the years but this is by far the best. If I dab this on a blemish at night, it is either gone by the morning or significantly gone down. Also great as if doesn’t dry out the skin unlike other harsh blemish products. Okay, there appears to be two main issues here, one, does it work? and two, the cost! For me it made a difference, it is part of a new evolving routine for me, obviously for some people it hasn't helped so all I can really do here is put my review forward in the plus column. In terms of cost a bottle lasted me about a month adding it directly to my skin rather than mixing it with another product, however for three of those weeks I was on holiday and as I was getting such a positive result I was not happy with the thought of cleansing and not replenishing therefore I was actually applying the oil three times a day, to include when I was getting ready of an evening. I have just ordered my next bottle, I am however also having good results with Disciple Skincare and the discovery kit is particularly good value. I used it as spot treatment on my hormonal breakouts on my chin. It stopped it from developing into full blown pimple, that would normally last a few days. I used it at nighttime, and the spot had retreated by the morning. Due to amazing reviews I decided to give it a try. At the beginning it seemed to start doing wonders, but the effects didn’t last long, breakouts not only were back, but also they were heavier than ever. I had to stop using this product. I'm in my thirties and have dehydrated acne-prone skin. I still get the occasional topical pimple and I suffer from hormonal acne. This oil works on both! It's especially miraculous to me that it treats hormonal acne, and often can make it disappear long before it's really set in. IMPORTANT: I use it as a spot treatment exclusively. At most I spread it (alone, never mixed, so one drop is enough) to a targeted area on my face. 1 bottle lasts me 3-6 months. The concentration is really powerful. I believe it's not meant for use as a preventative treatment to spread all over the face at all. Also, mixing with a moisturiser will reduce its effectiveness so I really don't understand why the brand advises it. This was a part of a new facial regime I was trying to control recent breakouts. It didn't work for me, I gave it 3 stars because even though it wasn't beneficial, it didn't harm either. I felt like my skin didn't absorb it well. but then really I don't think its a bad product, I have recently discovered that oil based products aren't for me. Even though I am obsessed with natural ingredients my skin just doesn't absorb heavy oils. Honestly, I've never left a review for a product in my entire life but after using this product and getting instant results, I just had to say something. I've been suffering from acne-prone skin for a long long time and have tried pretty much EVERYTHING to clear up my skin (Antibiotics, Roaccutane etc.) I received this in a goodie bag (thanks Cult Beauty!) and didn't really touch it for a long time as I was so averse to putting anything oily on my face. Now I really wish I had tried it sooner, it cleared up my congested forehead in DAYS - I just use 2 drops and mix it into my moisturiser in the evening. After seeing such fast results, I also ordered the Combination serum which I use in the morning. You only need to use it sparingly so it doesn't run out particularly quickly. That being said, I'd love to see a 'full-size' version of this miracle worker. I was so thrilled to receive this in the spring goody bag because it was targeted for acne prone skin and my chin area is a gold mine! This stuff really helped clear my chin acne and cool my skin when it started to get all red, bumpy and irritated. The price is a kick in the gut however maybe I’ll be inclined to purchase if there’s a 20% off code. A good replacement for me is the MV jojoba oil which makes my whole face resemble a baby booty. Or The Ordinary which is the best quality/price brand. I use this every third night, when I use retinoids and exfoliants the other two and my skin feels compromised. I also used it as a moisturizer daily. I don't mix it though with my cream, I use it alone (2-3 drops). My sensitive, acne prone, combination skin has loved it. Will repurchase it. My reddened skin has calmed down, and my huge acne flareup due to the retinoid has finally ended. Couldn't be happier. I took the plunge with this product and the moisturiser after reading all the reviews and because there was a free gift which was the Carrot Serum. I'm so impressed and so is my skin! I suffer from spots and a lot of redness on my chin and this product has calmed it down and I have not broken out once since using it. A little goes a long way, so it's worth investing despite the expense. I want to try the oil for the eyes next. A fabulous brand. I also bought Tata Harper spot treatment to see which one is better, but this oil does work. After I pop a spot I apply some acid and this oil and it really helps healing. It also works for preventing new spots. Amazing oil, it has really helped my cystic and hormonal acne. I received a sample of this product and fell in love. I purchased the full size bottle and I was really amazed by how well this worked for my skin. I have acne prone skin and I used this religiously mixed in with my moisturiser and it worked wonders. I felt my skin improved and it was looking healthier. My skin was also more moisturised as this is an oil based product. I highly recommend this product and would repurchase it again. I'm a bit of an face oil enthusiast so I decided to try this one. At first I thought it wouldn't work for me when I applied it to my skin neat I developed some new spots. Then I went out and bought a very inexpensive, basic organic moisturizer (because I didn't want to try out the Odacite one right away for fear it wouldn't work for me either) and blended in 2 drops. BOOM! The spots cleared up within a day, so this serum cleaned up after itself. I now use this every day and continue to see improvement. I think the oil on it's own is a bit to powerful for my somewhat sensitive skin. The only con I can think of is the very strong smell. Olive-y and the cumin especially can be overpowering, but it's too good not to use. I have combination skin with large pores but this provided minimal results compared to other oils I have used. Having said that, it's a lovely oil and I love the smell but plain old argan oil did more for my skin. And it's pricey - I would spend more on a nice Sunday Riley oil that lasts longer and does more for my skin. I had under-skin pimples that have bothered me for a while now. I started using this oil on cleansed skin before any serums or moisturisers, and these pimples disappeared quicker than I thought. I first thought that I probably should have got clogged pores oil on my under-skin pimples, but this black cumin oil exceeded my expectations. I already have 6 different oils from Odacite and love them all, feel like I need to own all of them. I mix these oils with serums, creams, other oils, even foundation. I am impressed. The price is on the higher end, but they are worth every penny. A potent spot treatment! Don't be fooled by the small size, it's highly concentrated. Overtime, it reduces inflammations and gets rid of spots. Plus I've found the smell pleasant and uplifting. Help me clear all pimples and hormonal acne in just 2 weeks. I really can't live without it! I've had bacterial and hormonal acne since I was 12. I'm 23 now and I've got a skincare routine that keeps my skin moderately clear although it costs a lot of money and requires a lot of effort. This product does work but it's not a lifesaver or 'must have'. It's more of a special treat for someone who suffers from blemishes/acne. I can't use this every day or it will irritate and dry out my skin. I use this about once a week in the morning mixed in with my daytime moisturiser and it works nicely. Don't expect miracles using this, but it will help and I like to repurchase it when I run out as I do appreciate what this does. Like most customers, I read the reviews and thought I had to try it out. After paying so much for a tiny bottle, I gave it a go. Followed the instructions but for some reason it made my spots even aggressive and broke out even more. Such a shame, as I had really had high hopes for it, definitely not for all skin. If I could give it a 100 stars I would! I know everyone says oil is essential regardless of how oily your skin and its true but still you have to be careful about is which kind of (essential) oil you use. I have complicated combination skin that breaks out often from hormonal and new products. I bought this product simply from reading the reviews and a beauty blogger on Instagram who raved about it having similar skin problems. I honestly have loved it, it's very effective and gentle. It smells great. I apply to targeted areas and when I wake up in the morning my spot is gone and my pores have shrunk overnight! I simply love it as I have tried many blemish products that dry up the skin but don't provide any further benefit. This oil serum is the opposite of those spot busters. I also love the inspirational story of the owner /creator. I am on my 2nd purchase and I will buy again. I don't mix it with my moisturiser as I think that's a waste as it is a small quantity product which helps it maintain its potency. I don't use it everyday. It works effectively when I have a spot but doesn't prevent future pimples from erupting. Still highly recommended! Really wanted to love this but the pimples serum concentrate didn't work out for me. Instead of healing and clarifying my breakouts, this made those zits angrier. I guess what works great for others may not work the same way for me! I've had much better luck with Living Libations' Zippity Dew Dab. I used this as per the instructions on the bottle (added 2-3 drops to my moisturizer, twice a day) and lasted me under a month. It also wasn't as effective as I had expected on my active breakouts. It wasn't unpleasant to use but for the price I paid, I expected more. It is very overpriced for the amount you actually get. It works out to be slightly over £5 per ml which is ridiculously expensive! I can't afford to maintain the cost of using this in my skincare routine. I have suffered from acne for a while and have been trying to find something to help it and I found this! I have cystic acne under the skin on my jaw line and side of me face and little on my cheeks I have a lot of peach fuzz on my face and they keep getting blocked I had so much at on point I couldn't take it but once changing my whole routine including this and the jojoba oil I have really seen a difference in my skin and its only been two weeks. Once this is applied the spots really reduce in size and I have seen such a difference in my skin if you have the same as me this will help you although the only thing is the price of the bottle, i'm actually on here buying a new one because I have used mine after two weeks! but I will pay if it works for me to have clear skin also once skin is clear you wont need to use as much just to maintain it! so to sum it up if u have cystic acne and blocked pores use this and the jojoba and lavender oil Thanks to this product i'm on my way to clear skin!! I have oily/combo skin with large pores. I thought I would regret this because well I tried a lot of serums and they broke me out and made me look oily. I ordered this along with the combination serum and I love this. whenever I have this on people tell me I'm glowing and my pimples did disappear. I still do get the tiny whiteheads but those painful huge ones have become rare and they do go away or not surface. To be honest I was very skeptical. But after reading so many good reviews I decided to give it a try. And wow, this little guy works wonders. Even for hormonal acne which is my main concern I tried to solve with doctors with no success. One drop is enough for all my breakouts so the size doesn't concern me as much as if I'd need to use it on my whole face everyday. If you are coming back to this gem being concerned about the price, just order it, you won't regret it. I first received a mini sample of the hyperpigmentation serum of Odacite. I immediately fell in love with the natural scent of it. I started to look at Cult what else this brand had to offer. Well, thanks the (earned) good reviews I bought this one too. Surprised by the effect and how quickly it made my skin much better. I have a combination skin, with lots of small pimples on my forehead. All the imperfections disappeared like snow in the sun. And I am only using this for 5 days. Definitely 5 stars and worth buying. Scent can bit a little overpowering if you are not used to cooking or eating anything with spices (Indian, mediterranean), but it was very faint to me. This tiny bottle will last a long time. I just use 1 tiny drop as spot treatment and mix another drop with my gel moisturiser. Twice a day. Used under my foundation, last the whole day. Gives my face a healthy glow, keeping my pimples in check. Now tempted to try the other range of serums. Have my eye on Vital Glow. This was in the last goody bag, thank you Cult Beauty. It had instant results. I love the concept of mix and match and treating your skin with what it needs each day, however I'd love these to come in a larger size for those of us that want to use this daily for a while. I finished it in two weeks. Reordered and used more cautiously and have run out again. I will keep buying, but would rather a supersize version despite the price point it would come in at, I'm happy to pay for products that work as well as this. I am about to purchase my second bottle of this. Over the past two years my skin has gradually became worse and worse. I've tried numerous products and skin care regimes and nothing truly seemed to help clear my skin. Once it eventually got better, another huge breakout would happen and the cycle would repeat and repeat. This product has undeniably helped me and if I could I would gift this product to every single person I know just to try. I bought this product alongside the Kypris Clearing Serum, which I used first for a month, and I noticed a difference but it didn't clear my skin like this stuff does. I noticed within a couple days of use that it was shortening the life spam of a spot on my face. I apply this product in the morning, mixing in one drop with the SkinOwl Lavender Beauty drops. In the evenings I use the Allies Of Skin Overnight Mask, and that is my entire routine. Every now and then I put nothing on my skin for a day just to give it a breather. I also exfoliate twice a week with the Oskia Micro Exfoliating Balm. I've really found that keeping my routine simple and not applying too many products has helped. If I'm having a bad breakout, I might apply just this oil to my face overnight. It is expensive for the amount you get, but my bottle has lasted me 5/6 months, you don't need much product as it's quite strong and you should be mixing it in with your moisturiser. As well as this product, in my diet I've been avoiding dairy, came off my contraception, and I've been taking MSM supplements, L-Lysine, Zinc and probiotics. To help my skin heal as I was left with a bunch of scars once the spots stopped appearing, I did 6 courses of LED light therapy (20 mins each time) - which also made a huge difference to my skin and I would recommend. I'm sat here now with no spots on my face and a couple scars which will heal over the next few weeks. I'm in utter disbelief that my skin is where it is right now, 2 months ago it was so bad, I had clusters of spots on both cheeks, along my jawline, my chin and scattered around my forehead. I took daily photos so I could see if any progress was made(or not made) and the change is incredible. Thank you Odacite! I love this stuff, I'm on my second bottle. I find that if I dab this on spots it doesn't really do anything to them, but if I rub it in they reduce by morning. The only thing I have an issue with is the tiny bottle and the price. A little does go along way, but I use 1-2 drops morning and night when I have a bad breakout and it doesn't last very long. I had a bad reaction to a cleanser recently, about 7 breakouts because of it. I mixed this into my moisturiser for 2 days and night and 4 of them went with no marks after. Not a miracle worker but very close to!! Seems to push out blackheads! This smells like pencils at school in the 70’s! It seems to actually push out the blackheads, I noticed within a few days of use. My skin is really oily and I've suffered with acne and blackheads most of my life. This was such a surprise as I've bought so many products that make claims and every time I got my hopes up only to be disappointed. I'm really pleased with 'Pimples Serum' and just purchased the 'Grapeseed & Grapefruit' to try. I have oily skin, spots are my main concern, but recently i'd started getting several small pimples as well; i thought I'd try this serum to see if it could keep improve my complexion. After using for one day (2-3 drops in the morning and night), pimples (and or or two spots) developed over my forehead, cheeks and chin. I thought my skin might need an adjustment period, so continued using for 3 more days, but it just got worse. I stopped using this for a week, whilst my skin recovered/ returned to it's normal state, then tried again, using only 2 drops at night as a treatment. The pimples had returned by morning. I've been having some adult acne on my chin are since a half year or so, and whatever I've used, nothing really helped o get rid of it completely. It's quite pricy for the amount of product, but I'm telling you It's totally worth it! I mix it with a moisturiser in the mornings, and in the evenings I massage few drops directly on the blemishes on my chin area, and it helps to heal the spots & scarring faster and also it stops new pimples to come trough. I'm very impressed, highly recommend this produt! Was skeptical but it's a great product. Small bottle but you only require a few drops daily. I've been using this for about three weeks and the difference is incredible. As in, no spots. I mix two drops in with my regular moisturiser and just add a bit more moisturiser at night as my skin's dry. The moisturiser's water-based so it mixes in well - no separating. I get a slight tingling when I first rub the mix in, but it disappears and there's no problem wearing SPF or tinted moisturiser over top by day. Super product - definitely want to try others in the range.